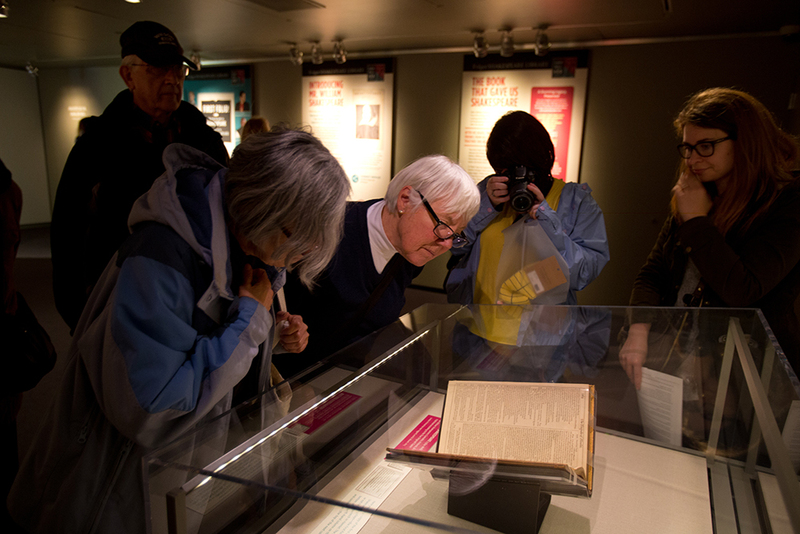 More than 12,800 people, including theatre aficionados, middle and high school students, seniors, and families, visited the Central Library between March 21 and April 17 to see First Folio! The Book That Gave Us Shakespeare. 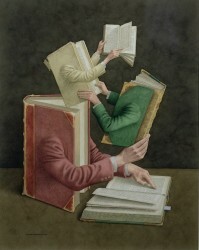 Support from donors to the Foundation made it possible for the Library to host the exhibit. For many visitors, it was a once-in-a-lifetime experience. One elderly patron, who is losing her sight, she d tears of joy as she gazed at the rare book of Shakespeare’s works. A group of high school students discovered, much their delight, that the copy of the Third Folio (on loan from the Pigott Collection) was opened to “As You Like It.” The students had recently staged a production of the play, and, as they stood gazing into the display case, they couldn’t help but pick out their lines and recite them aloud. In addition to the gallery exhibits, local artists, both amateur and professional, used a specially built stage on Level 3 perform Shakespeare’s works and music of the period. Shakespeare films were also shown in library branches throughout the city. Foundation donors made this exhibit happen. City tax dollars only go so far in providing funds for our libraries. But with the help of our generous donors to the Foundation the Library is able to embark on ambitious projects like the First Folio and have a major impact on the cultural life of our city. Dad: Remember The Lion King? Dad: Yeah, Shakespeare wrote that. Well, in a way, he did. Truly Shakespeare was not of an age, but for all time. The Rainier Beach Branch, which had been closed since August 2015 for building maintenance and interior renovations, is now re-opened! The renovation project included replacing the roof on an older section of the building; installing beautiful new carpet, paint and furniture; and creating more flexible and useful spaces for children, teens, adults and families. The Library also reconfigured the interior layout to create flexible spaces for children, teens and adults. The interior changes at the Rainier Beach Branch are part of City Librarian Marcellus Turner’s vision for The Seattle Public Library. One of his five service priorities is “reimagined spaces” – creating new uses for spaces in our libraries to better meet the changing needs and expectations of patrons. One of the biggest changes patrons will notice is the openness of the new floor plan, as well as the bright new lighting. 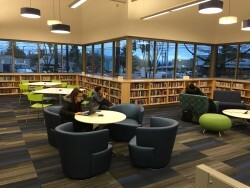 A “quiet zone” has been established in the adult area, a new Friends of the Library Multipurpose Room has been added, and a lobby seating area has been installed where patrons can eat and charge devices. Another interior addition is the new Digital Media Studio, where patrons can use Adobe Creative Suite software on Library computers to edit videos and music, touch up photos and create graphics. Additional software for developing video games and graphic manipulation will be added in the future. The branch will also have some new devices available for checkout – six laptops and two iPads will be available for patrons to use in the branch. In November, the Foundation helped the Library host Startup Weekend EDU, which brought together a community of people focused on solving problems related to education. Our business librarians were available all weekend to provide reference and research support to 90 education technology entrepreneurs. During the first session, all participants — college students, educators, designers, engineers, and business people — gathered in the Central Library Reading Room to pitch their ideas for a product that would impact education. Participants then formed teams around the 10 strongest ideas and got to work crafting a viable product and business model to present to the public on Sunday. The teams worked throughout the weekend, researching market trends with librarians, validating their ideas by interviewing potential customers and stakeholders, building models and websites, seeking advice from mentors and coaches, and crafting a final presentation to show the event judges. Each of the 10 presentations was well thought out, creative, and high-quality. Several teams created websites and platforms that were fully functional. It was awe-inspiring to see how each team worked together to accomplish so much in just one weekend. The judges at the event awarded third place to Campfire, the crowd favorite, an idea to bring an immersive experience to children’s books. Second place went to Class Volt, a platform where teachers can share ways they successfully use technology in the classroom. Finally, the first place prize went to Floop, a tool that allows students to submit assignments through mobile devices and get instant feedback from their teachers. 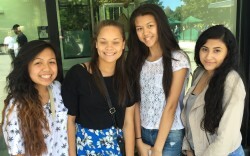 These top three teams each won prizes to help them continue their business startup ideas. The larger aim of Startup Weekend is for all participants to network, exchange ideas, and learn important skills and concepts for starting a business. Thanks to support from The Seattle Public Library Foundation, the Library became an entrepreneurial think tank for the weekend and 10 ideas were developed into budding business startups that have the potential to create jobs and fund our economy. Kazuhiro “Kazu” Kibuishi is a Japanese–American graphic novel author and illustrator who is a rock star for young readers. Donations to the Foundation helped bring Kazu to the Central Library and helped several public schools arrange field trips to hear him talk about his books. A couple weeks ago I was invited to bring the 4th and 5th graders from my school to the Central Library to hear author Kazu Kibuishi speak. It was a marvelous opportunity to hear from a tremendously talented man and my students just drank it up. Mr. Kibuishi talked about his art and his books and how he became an author/illustrator. Moreover, he talked about persistence, and doing what you love and about overcoming hardship to turn it into something positive and important. It was the most fascinating and worthwhile author presentation I’ve ever attended, and I was so thrilled that my students and students from Beacon Hill Elementary were able to experience it. 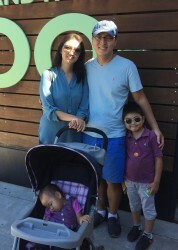 The Kimball kids have been buzzing about Mr. Kibuishi and his books ever since, and show no signs of stopping. 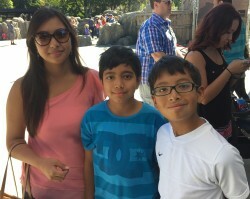 I want you to know how important experiences like this are for my students. They really felt special to be invited to this event, and I believe many of them learned lessons they won’t soon forget. 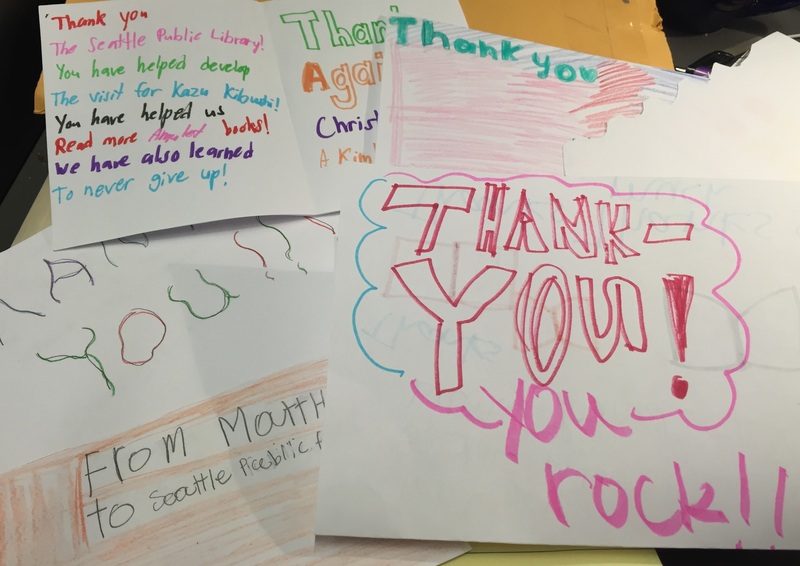 We owe a huge debt of thanks to the Seattle Public Library Foundation for making this all possible. I want you to know that you touched hundreds of young lives in a very special way through this single event, and thousands more through the work you do throughout the year. Two hundred and eighty first graders from four Seattle public elementary schools in the Rainier Valley visited the Central Library in November as part of a Foundation-funded effort to encourage reading. The classes came by bus and spent the day at the Library, enjoying a special tour, program, and scavenger hunt. 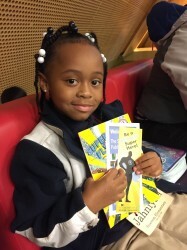 At the end of the day, each child received a book to take home. These students are all “early readers,” meaning they’re just starting to read on their own. This is a critical time for children and it is especially important to guide them to books that are just right for their reading level—not too hard and not too easy. This is where help from the Library’s robust collection and skilled librarians can play a major role. Research shows that reading follows an upward spiral—the better kids get, the more they read. Thank you for helping the Library encourage these early readers! The goal of the Creative Aging project was to bring older adults into the Library to gain new skills and improve their quality of life. This project served as a pilot to test the concept of the Library as an active learning center and its ability to work more intensively with seniors in their neighborhoods. 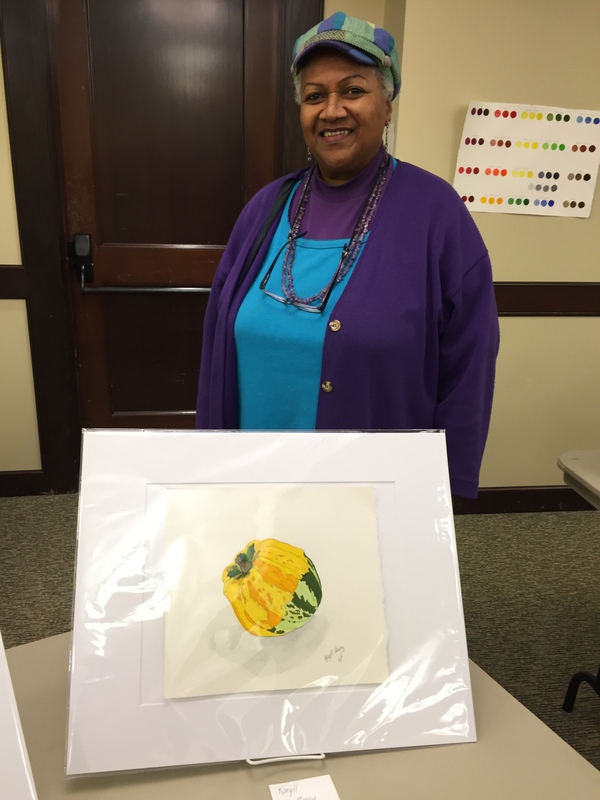 Foundation support from donors like you allowed two groups of seniors to explore the art of painting with watercolors as part of the Library’s Creative Aging project. The classes scheduled at the Greenwood and West Seattle branches this fall ended with an art show featuring their work. The project was an overwhelming success—32 seniors were part of the watercolor classes taught by two local teaching artists. The classes were so popular that they filled quickly and there was a long waiting list in both neighborhoods. Are you planning to buy books for holiday gift giving? Here are some thoughts from Library staff on what they’d like to give and receive for the holidays. Linda Johns, Adult Services Librarian, wants to give “Hunger Makes Me a Modern Girl” by Carrie Brownstein. She says, “I’d love this memoir no matter what, but the Seattle and Puget Sound references sealed the deal for my devotion.” Linda wants to receive “By the Book,” edited by Pamela Paul; selected pieces from the New York Times Book Review feature where writers and other notable people talk about books they love and their lives as readers. 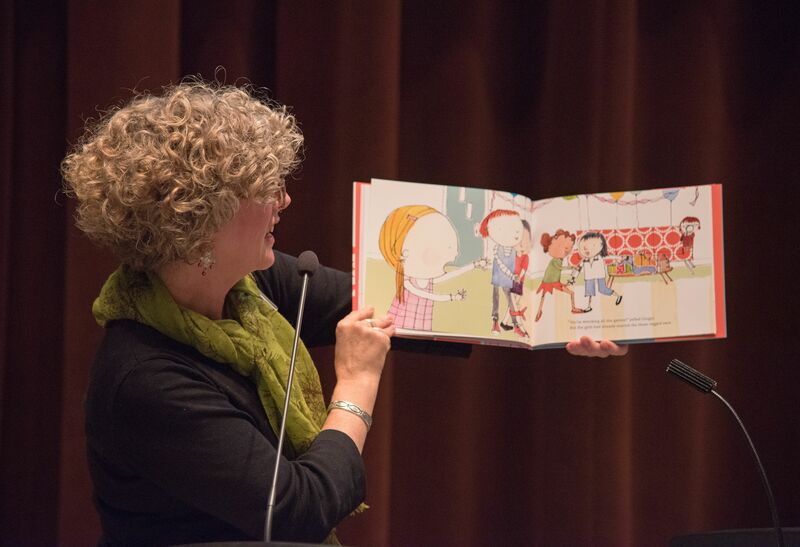 The 2015 Washington State Book Awards were announced on Saturday, October 10 at a special ceremony at the Central Library. In case you missed the announcement, here are the winners along with links to reserve them in the Library catalog. Your support helps the Foundation continue the tradition of honoring our state’s best writers. Children and teens got a really wild prize for participating in the Library’s Summer of Learning program this year – free passes to the Woodland Park Zoo! 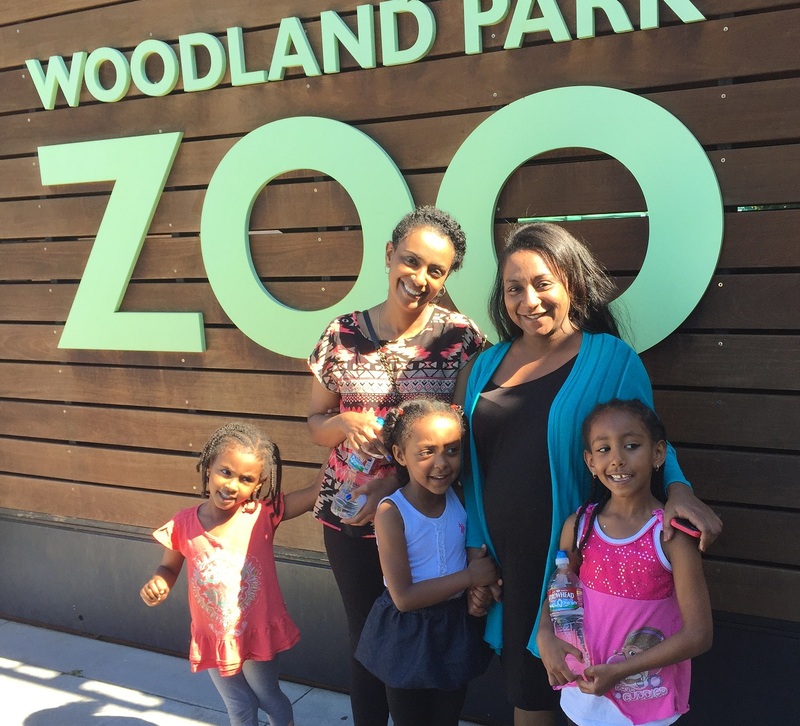 This weekend the zoo welcomed 4,800 children and families for a free day of fun and learning. Your support of the Foundation helped families from across the city take part in this program and keep reading during the summer months.